I made these two sets of cups and saucers at the same time I was making work based on my walks around Canberra and around Guerilla Bay on the NSW South Coast. 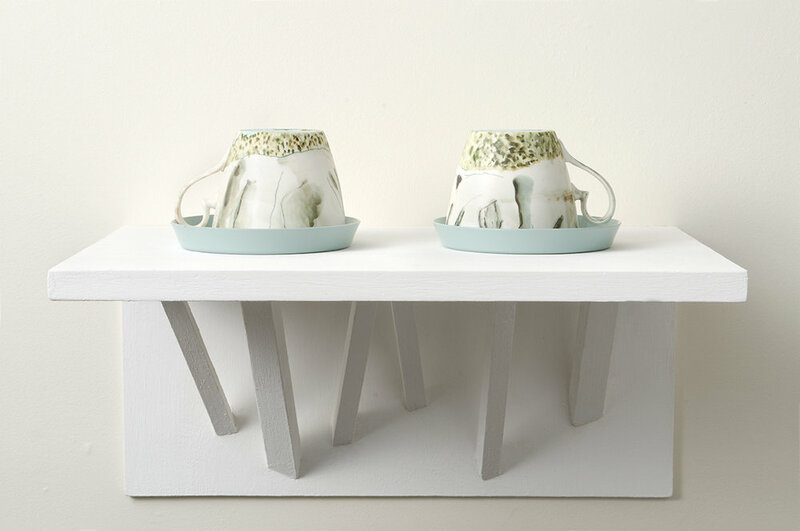 Seeing a cup upturned on its saucer in my studio one day I wanted to try and make a metaphoric connection between the cup and saucer as an entity and the natural world. The upturned cup in Island becomes the island that can be seen from Guerilla Bay and its blue saucer becomes the sea, while in the Lake pair, the cup becomes the lake and its glass saucer the land. Confusingly, Lake Burley Griffin also has small islands, the one on the cup of Lake is the island on which a Carillon stands.